Everyone has heard the famous wives tale that cockroaches can survive the blast of a nuclear bomb, but not a lot of people know if it’s true or not. Lucky for you, that is the topic of today’s blog! It’s 6:50 am and a nuclear bomb has just gone off leaving nothing behind but the crumpled concrete shells of what used to be buildings. As the sun rises and the smoke clears, you see in more detail the destruction that had ensued the moment the nuke impacted the soft dirt. Off in the distance, you see something shiny, a small speck of light in a wasteland of what used to be. You make your way towards it and lift up the metal sheet pinning down your new shiny prized possession. Moments later the sheet crashes to the floor as you leap backward in disgust and fear. “It couldn’t be”, you say as you try to comfort yourself. “It shouldn’t be”, you whimper. But it is. To your dismay, you have to accept the impending truth. You’re alone on this Earth. Alone with nothing but cockroaches. Yeah, that introduction was a little dramatic, but after all, you did read it. Can you imagine if that was something you truly experienced? Being alone with the grossest pest on earth? Yuck. Luckily you will never have to worry about that nightmare coming true, because contrary to popular belief, cockroaches could not survive an atomic bomb. Cockroaches can’t survive an atomic bomb, but the myth wasn’t completely false. Cockroaches can withstand high levels of radiation because of their simple cell design and slow cellular cycles, but a cockroach would most definitely burn, just like everything else in the event of a nuclear explosion. While cockroaches can’t survive nuclear explosions like we previously had thought, they can do some equally impressive/ terrifying things. Cockroaches can live up to a week without their head. We thought it was impressive that chickens can run around for a while, but cockroaches actually live for a whole week. Cockroaches eventually die of thirst, because they can breathe without a mouth but they can’t drink water. Cockroaches can hold their breath for close to an hour and half-an-hour when submerged underwater. Next time you’re chasing a cockroach across the room, don’t forget to check the dog bowl. A newly born cockroach is around the size of a speck of dust but can run as fast as a fully grown cockroach. Cockroaches can go one full month without food, and one whole week without water. Cockroaches are prehistoric creatures, with science dating them back to around 280 million years ago. 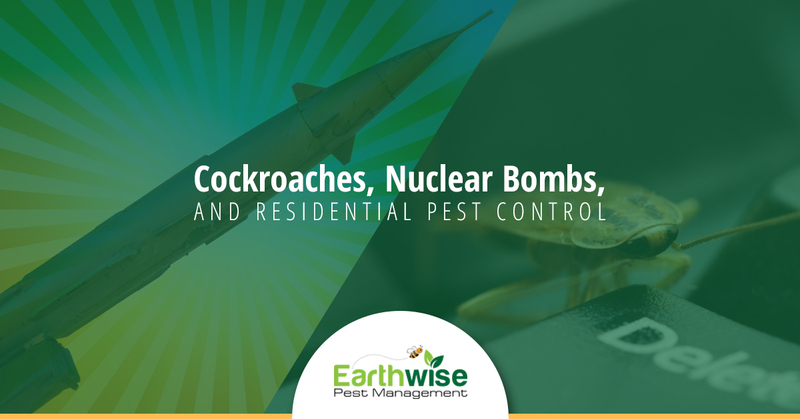 Cockroaches can’t escape our professionally licensed exterminators at Earthwise Pest Management. Cockroaches are disgusting pests that infest homes in the Sacramento area quite often, but luckily, at Earthwise Pest Management, we have the best pest control exterminators and the best pest management strategies. If you ever have cockroaches in your home, call us and we will do what even high levels of radiation can’t do; get rid of the cockroaches. Contact us today if you have any questions regarding our pest control services or our pest control pricing. Thanks for tuning in!